Joanne Vliet is the director of the Silicon Valley U.S. Export Assistance Center, in San Jose, California, part of the network of 108 Export Assistance Centers located throughout the United States. 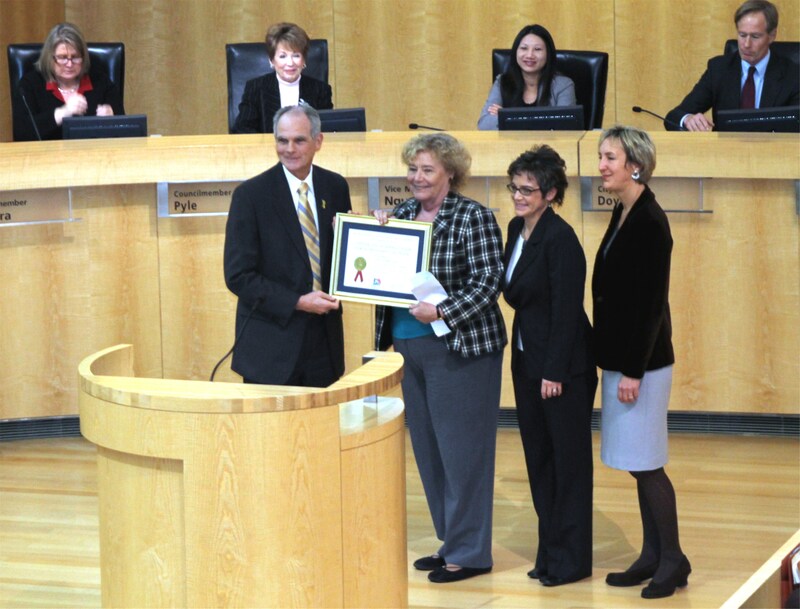 Congresswoman Zoe Lofgren presented the Commerce Department’s Export Achievement Certificate to the City of San Jose. San Jose Mayor Chuck Reed accepted the award. Over the past few months, Congresswoman Zoe Lofgren has been busy recognizing companies and organizations in her Silicon Valley district for their significant achievements in exporting. Four Silicon Valley technology firms and community organizations have been awarded the Commerce’s Department’s prestigious Export Achievement Certificate, which were presented by Representative Lofgren. Silicon Valley is recognized worldwide as the epicenter of innovation and entrepreneurship, but also is an exporting powerhouse. The San Francisco Bay Area is the fourth largest exporting region in the U.S., with nearly $50 billion in exports annually – more than half of which come from Silicon Valley. The Valley has also been a bright spot for employment in recent years. Silicon Valley leads the region with the greatest percentage increase in jobs in 2011 — and those jobs are tied to exports. Indeed, San Jose has the largest percentage of jobs created by exports in the entire United States, which is both an impressive statistic and significant benefit to the region, as exports typically support higher paying jobs. In recognition of these organizations’ accomplishments in exporting, Lofgren presented U.S. Department of Commerce Export Achievement Certificates to Echelon Corporation, SolFocus, San Jose State University, and the City of San Jose. All have worked with the Commerce Department’s local Silicon Valley U.S. Export Assistance Center to expand into overseas markets. 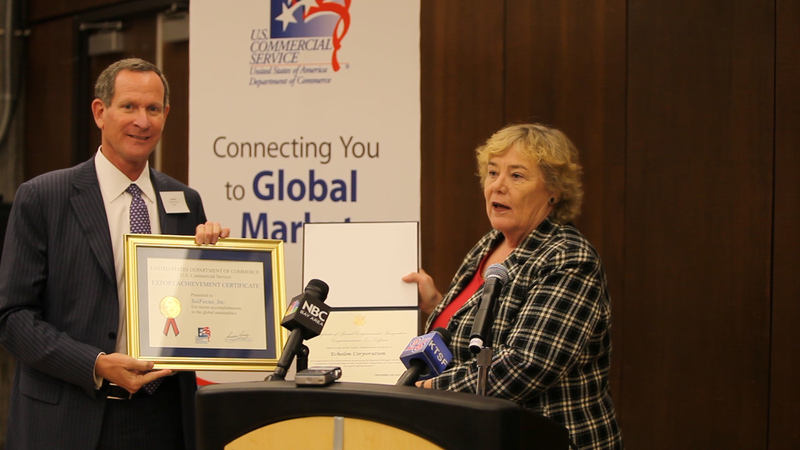 Congresswoman Zoe Lofgren presents Ron Sege, CEO of Echelon Corporation with the U.S. Commerce Department’s Export Achievement Certificate. SolFocus, a producer of concentrated photovoltaics, also headquartered in San Jose, deployed business development staff to Australia in 2009 to meet with a dozen business prospects. Through the Commerce Department’s Gold Key Service, SolFocus was introduced to local development partners for a $2.3 million project at the Alice Springs Airport. As a result, 28 SolFocus arrays began generating power for the airport’s internal grid in the summer of 2010. The fast-growing clean tech sector depends on outstanding business managers and engineers, and in Silicon Valley, many of those highly skilled workers attended San Jose State University. Higher education is one of the top ten U.S. service exports and San Jose State is one of the 200 top research universities in the nation. With more than 30,000 students enrolled, San Jose State University also has become a leader in attracting foreign students. Through its Office of International and Extended Studies, San Jose State has engaged with the U.S. Commercial Service for the last 15 years to expand their international student population and international partnerships around the world. Since that time, the U.S. Commercial Service’s global network of trade professionals and programs has supported San Jose State’s efforts through trade counseling, business matchmaking, and the recruitment of academic delegations and partnering activities with educational organizations in countries such as China, India, Russia, Japan, Taiwan, among a number of other markets. As Representative Lofgren noted, “Exports constitute an important element of the growth of San Jose’s economy. We have the highest percentage of jobs created by exports, which attests to the benefits of international trade for our companies and for our City.” The U.S. Department of Commerce’s Silicon Valley U.S. Export Assistance Center plays a key role in Silicon Valley’s trade promotion infrastructure by helping grow and foster export activities in the community. Through awards such as the Export Achievement Certificate, the U.S. Commercial Service recognizes the contributions that companies such as Echelon and SolFocus, as well as organizations such San Jose State University and the City of San Jose, make to the success of the Silicon Valley economy.